All three buses arrived today even though we had big issues with the Icelandic volcano. Due to excellent work from Corporate Travel back in the States and our team here on the ground — we got everyone in safely and on time this afternoon. Some went out to eat, some napped and some went out walking. 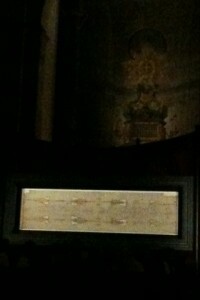 Many of us got a preview glimpse of the Shroud of Turin where we will go tomorrow to see it up close. I went on an excursion with my running shoes and saw a lot of Turin and the Shroud (click link to see my map and pictures). Turin is really called Torino. We all had a welcoming meeting, a good dinner with good wine and then everyone crashed in bed after a long day. We are glad to have everyone here safe and sound and on time. Tomorrow we leave at 9 AM to see the Shroud of Turin! Everyone is VERY excited! More soon. So glad to see you all there-especially PEGGY T! Hooray, she got on the plane-have fun!